1) Abundant availability at reasonable price. 2) On the shelf it adds to product appeal. 3) Available in Bright and Matt finish. 4) The best packaging material because of its excellent barrier properties. 5) Friendly to all conversion process including gravure printing & UV Lacquering With the use of transparent inks it produce pleasing metallic colours which enhance design and shelf appeal. 6) Heat seal medium coating also contains no toxic substances. 7) Hygienic, Light fast and heat barrier, Impermeable to transmission of moisture, vapour and gases. 8) Easy to run on Form, Full and seal machine. Glassine Blister paper with 40/42 gsm Glassine paper and 9/12micron supplied with or without printing as per customer requirement. 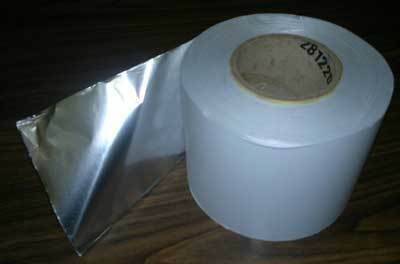 30 or 40 micron aluminium foil laminated with 150gauge poly is supplied with or without printing. Triple Laminates of Glassine paper foil and poly for ORS pouches are supplied with or without printing. How can we offer it as such a low price ? By establishing cost-effective products through implementation of latest technological advancement. We are passing on the saving to you with the low price. At par with International Quality standard achieved through technology from American-based Company. Technical services rendered as and when urged plus FREE Artwork (Computerised design) for your required printed items with FREE Printing Cylinders/Rollers. Send Your current/existing printed samples of all your products in one Meter length and see yourself our action. Place order and get ready to receive International Standard Pharma Packing materials in your desired specification. Attractive range of Aluminium Profiles that we offer is designed as per the need of clients in making of ventilators, windows and doors. These are provided in various specifications. We supply these Aluminium Profiles throughout the world at competitive prices. These are widely appreciated by our clients because of high durability and customized design. We offer a distinct range of Aluminium Electrical & Electronics Application Profile that is manufactured with premium quality raw material as to achieve extreme durability. We offer these Aluminium Electrical & Electronics Application Profiles to various electrical and electronic products manufacturing industries throughout the world.. We do International standard packaging of these Aluminium Electrical & Electronics Application Profiles as to safely deliver at the client’s end. · Our specialization lies in procuring and exporting of a host of Aluminum Electrical & Electronics Section for the clients. · Heat sinks, thimble / lugs tubes, reflector sheets for lighting industry, monoblock pump motor body sections. Foil Board Lid Punching machine made to measure by innovative engineering Quality and Competence. Unlimited size of Foil Container Lid Board is processed speedily and precisely. Foil Container Lid punching Machine for reliability safe control, short set-up times and almost maintenance free operation. The Punching Dies are made according to drawing or films or punched samples showing the required punching Contour. Foil Laminated Board Lid Punching Machines work according to the ram-type principle which means that the material is pushed through the punching die. The small waste margin of 3 (Three) mm ensures economical production. Square cut stacks of 1000 Nos blanks are placed into the right-angled feeding tray between the fixed die and the ram. After release, the ram pushes the stacks through the die into the delivery tray in one stroke. Waste cutters are installed in the die to split the waste at any required point. The punching stroke can be adjusted to execute a ‘O’ Punch, which means that the stack is completely punched upto the final blank. It is the operator who determines the working speed as the machine is not controlled by a fixed rhythm. Once the material is completely inserted and aligned the punching stroke is released. Offers great advantages, as only the two lower surfaces of the feeding tray are used for alignment. 1. The one way system ensures low tolerance, as the material is inserted directly in front of the die. 2. The slit waste cannot pile up, because it escapes easily towards the bottom. 4. Size tolerance due to sagging on blanks are minimized as the punching direction of the upright standing blank is inclined. 6. Only one operation is needed for loading the punching machine which improves productivity immensely considering the saving of time as well. x 60 minutes = 3,60,000 Lids x 8 hours shift = 28,80,000 Nos.